Yesterday, I heard a sermon message covering John 6:16-24. This is the scene where the disciples were trying to row their way through a storm in a lake at 3am in the morning. The disciples struggled with their oars through the winds and rough waters to get to the other side of the lake. (This story is also told in Mark 6). 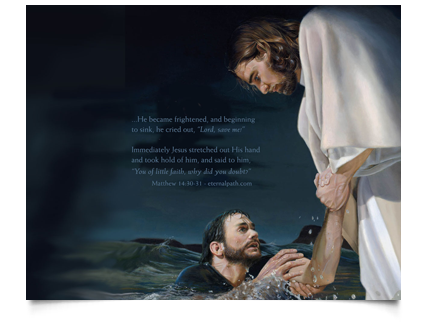 The emphasis of the message was to let Jesus be the one to take us through the storm from one side of the shore to the other. To trust Him through times of struggle. (I know… this is easier said than done. It sounds all good in theory, but what about real life?) Often, we see/experience Jesus do something amazing, and we get a spiritual high for a few hours or a few days. Yet, when struggles and trials comes along, we question whether He even exists, despite the amazing thing we may have just experienced with Him. Life is a series of trials. We are either 1) on a shore about to face a storm, 2) in the water going through a storm, or 3) on the other side of the shore, past the storm. The hardest part is of course being in the storm, that is when we question God the most. It is vital to remember that Jesus is the one who will take us through to the other side. If we try in our own strength, we will get tired and fearful. But, let us trust God to take us from one side to the other. 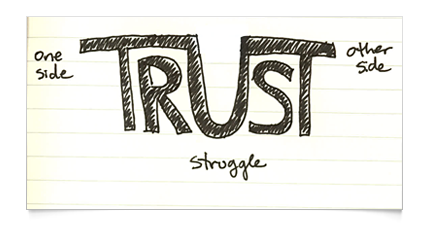 TRUST – there will be valleys in between, but with Him, we will make it to the other side. If you’d like to listen to this message by Pastor Gregg Matte, it is called Water Walker (part 1). Some other interesting points from the scriptures were: immediately, once the disciples let Jesus enter the boat, the disciples were at the other side of the shore. For us this means that immediately once we let Jesus take the oars to battle our storm, we reach the shore. Our destination is Him and with Him. Where do you think you are right now? Do you think you are on the shore about to face a storm, in a storm, or on the shore past the storm? I am so thankful to say that for me, Jesus recently just pulled me through a storm I had been battling for about six months, and how sweet it is to be with Him on the shore. During my storm, I held on to this artwork (see below). I put it up on my wall above my bed as a reminder that Jesus will pick me up. Be encouraged beloved that Jesus will pull you through your storm!! Praise God! !